Embrace the experience artfully crafted by our winegrowing stewards. 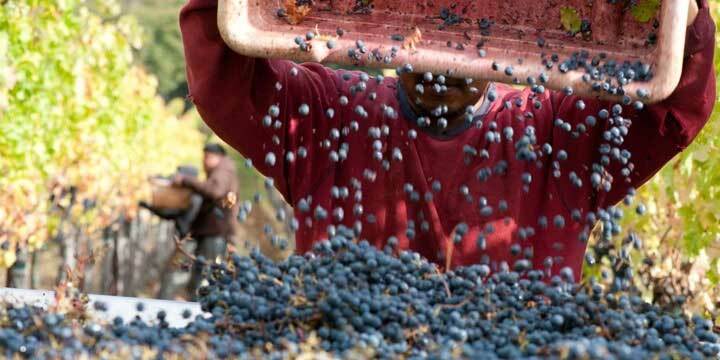 While multiple rounds of shoot thinning and fruit thinning occur in the vineyard throughout the growing season, a final sorting occurs just prior to grapes being crushed. Grapes arrive at the upper crushpad, just outside the massive doors to our wine caves, where our winemaking team (and often, family members including young Samantha and Sophia) will hand sort and visually inspect each grape cluster, retaining only those with the most even ripening. This final step in our season-long selection process ensures that only the most promising fruit is de-stemmed and crushed for fermentation. During harvest, we vinify each vineyard block separately, sorting not only by varietal but also by maturity and richness of character. This allows for each vineyard block to develop uniquely, providing winemaker Jesse Katz with an array of choices in flavors and characteristics as he develops the best expression of the estate for each wine in each vintage. 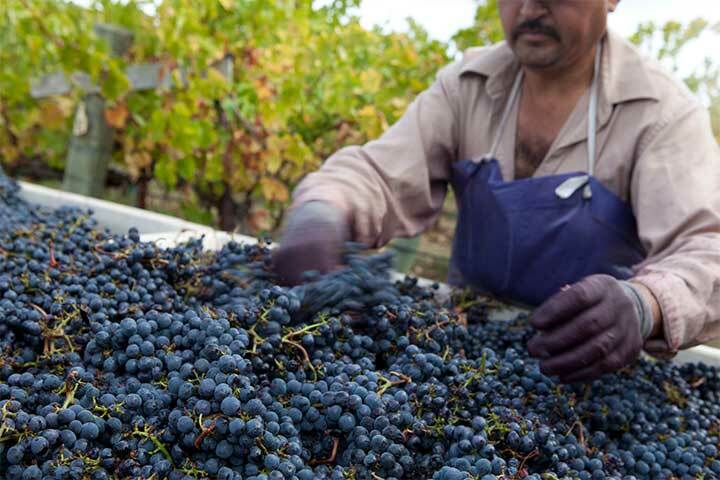 Since our winery lies at the heart of the Estate, less than one hour elapses from the time grapes are hand-harvested into small bins to the time they are hand-sorted, de-stemmed, and conveyed to fermentation tanks. After sorting and crushing the grapes, we cold soak the must (grape juice and skins) in temperature-controlled, stainless steel tanks for several days prior to fermentation. This traditional process gently extracts deep colors, rich flavors and tannins from the grape skins without allowing the juice to ferment. Once the maceration process is complete we rely on native wild yeasts living on the fruit itself and in the air here at the estate to ferment our wines. These native yeast strains help ensure our wines are truly born of Lancaster Estate and represent the terroir of this estate. 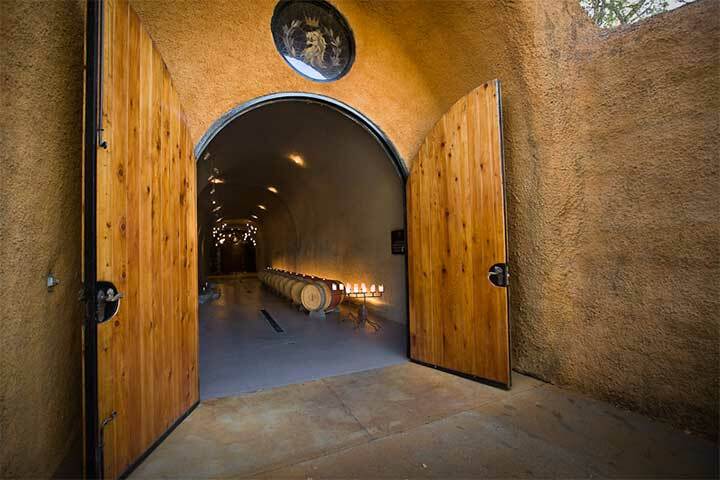 The finished wines are kept in separate lots and pumped over to French oak barrels to begin their lengthy aging process in deep inside our wine caves. Wines lie at rest, aging in French oak barrels for 18-26 months sur lie at optimal controlled temperatures and humidity in our wine caves. For added complexity, we age wines in barrels sourced from a variety of Coopers with the barrels toasted at varying levels (barrel heads are never toasted). Favorite Coopers include Darnajou; Taransaud; Demptos; Ermitage; Suary; Bel Air; and Sylvain. Each year one or two Coopers are added to the mix and evaluated for potential use. Oak is sourced principally from center of France forests including the Vosges, Tronçais, Nievre, and Allier. Lancaster Estate Cabernet Sauvignon is aged in 70-80% new oak with the remainder in seasoned barrels used for no more than two vintages. Nicole’s Proprietary Red sees 100% new oak each vintage. Ermitage crafts a custom barrel for our Sauvignon Blanc called Samantha’s Barrel. During aging our wines are hand stirred every week during secondary (malolactic) fermentation by opening each barrel and using a battonage rod to lift the lees and encourage full character development. Following secondary fermentation, battonage is continued and the wines are gently clarified by manual racking of each barrel according to individual barrel regimens developed by the winemaking team specific to each lot. Racking is dirty (with lees) for the first year, then clean (without lees) for the remaining months. Our red wines are bottled unfiltered to maintain the purity of expression and character.